Congratulations, you did it! You have crossed the finish line for the 31 days of difference, but that doesn’t mean that it will end the revolution that you have discovered within you—it’s just the starting line to another journey that you’re about to take and see around you. You see, everyday was a day to stretch you, to push you a little bit more out of your comfort zone, to encourage you to make a difference outside of you, which slowly created a change within you. There are some things you may have realized you LOVE to do, like helping out others or even discovering the beauty behind a stranger’s story; on the other hand, there are some things you may never want to do again, like talking to someone you don’t know may be a little too much, or writing letters is just not your “thing,” but at least now you know for sure a little bit more of who you are and aren’t. Not only that, you know a little bit more about how stepping outside of your borders makes this beautiful difference in somebody else’s life, and how it gives every day a value that nothing can take away. Maybe by focusing on being more and stepping out, you were able to see God step in more than you ever have before. Maybe you discovered something new about you, or found a part of you that you lost a long time ago, or even remembered how time is so valuable; but altogether, I hope from the bottom of my heart, that you will see that you were the difference all along. A movement doesn’t start around you, but within you—sometimes, it just takes stepping beyond your comfortable boundaries to discover a life without borders. So, go make a goal for the future! After a month of discovering yourself and serving other people, make a resolution to continually make a difference daily. Just like change in your pocket, if we save up the small nickels and dimes, we will build up value to invest in a treasure. It’s the same with the small changes you have made this month. Each small change added up to make a huge difference to a new year, and the best part is that it didn’t just change your journey, but it impacted many others' as well. A small change will make a great difference, so keep discovering, and keep moving in securely. Throughout this journey of 31 Days of Difference, we've done a lot of things. We've discovered our hopes and dreams, grown to closer than God, and helped other people. We've done more in a month that most people do in a year! As this is coming to an end, we can't forget why we did this. We didn't do this for credit. We didn't go out of our way so that we could be seen. We did this to discover the difference. 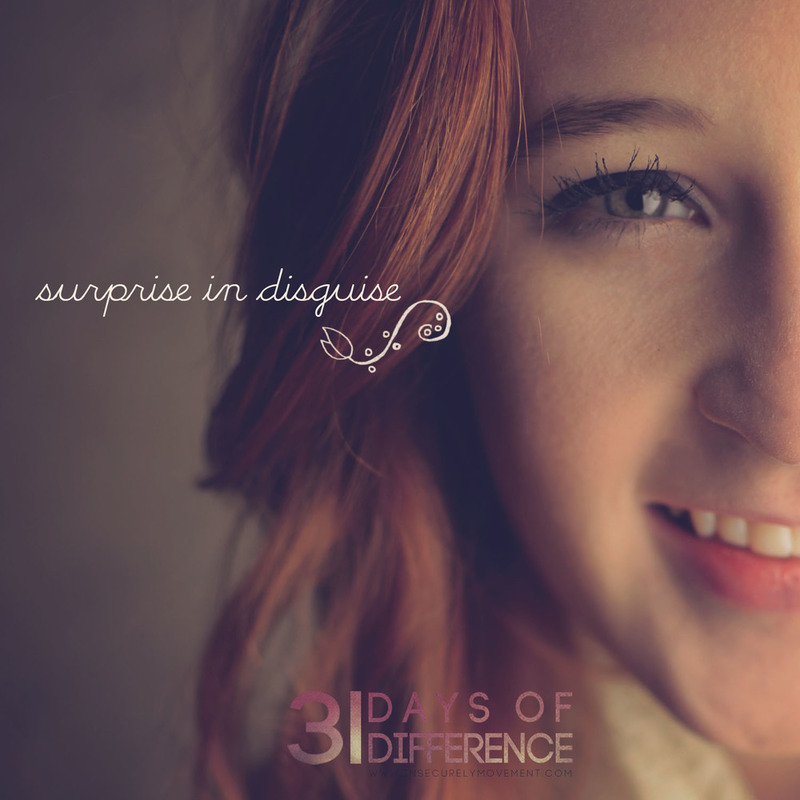 So, today - on the second to last day of #Discover31 - we're asking you to do something secret. We're calling it "Surprise in Disguise." Some people call it "paying it forward." I'm calling it giving. Give. Give where no one can thank you. Give so that you don't get credit. Give to someone. Go through the drive-thru. Pay for the drink behind you. Go to the coffee shop. Leave money for the person behind you. Go buy a little something for something and leave it in their room, their locker, or on their doorstep. Do something for someone else. Give. So far in life, one of my all-time favorite memories have been late-night rooftop conversations admiring the stars with my some of the best friends I’ve ever encountered. But even more so, one of my favorite pastime memories has been waking up at the crack of dawn for a week straight during my old home church’s high school summer retreat in Florida. There was nothing more motivating than the idea of getting to wake up, walk across the street, find my perfect place in the sand, just above the light morning ocean waves, stare at the breathtaking sunrise before me for a good ten minutes while my eyes are still opening, take out my journal, and write out my morning prayers and conversations with the God that has sculpted me. Sounds like a lot, and it is! That’s a lot to take in! On occasion, I take way too much advantage of the beautiful things that surround me. Sometimes I forget to look at the AMAZINGLY colored leaves Missouri produces until a tourist points them out. I want to give you this image for a second. Think about all of the most amazing and talented photographers in the world, the most professional, experienced, and gifted. These photographers have an eye for beauty and when they come across the most beautiful tree they’ve ever seen, most beautiful lighting, the perfect time of day where the sunset hits just right, they just have to capture it and share it with the world. (And I thank the good Lord that they do!) But we sit here day to day flipping through photos on Facebook, photographers websites, looking at billboards, our own capturings, awing over how “great the pictures are that we took,” forgetting that someone actually created the things inside of those pictures. Realistically speaking… that’s insane. I think the coolest thing I have ever created was an invention I made in the fifth grade for an “invention convention.” And you know what my invention was? Scented socks… Ha. Yeah. Scented socks…. I literally just soaked them in this scented oil stuff and then washed them. Obviously, I did not win because you haven’t seen my product on As Seen On TV yet. But my point is that anyone could have done that. I mean, God created stars. STARS: Fixed luminous points in the night sky that are large, remote incandescent bodies (dictionary.com). He didn’t just invent the sunrise so that five people could experience it and take pictures to show us on Facebook? He made it possible for each one of us to experience everyday if we wanted to. It’s almost like the sunrise and the stars are the most exquisite vacation homes built just for us. At no cost, whatsoever. It would be such a silly waste for us to not go on a free vacation every now and again. Here’s one we’ve all been guilty of at least once or twice. There we are, walking down the sidewalk. We notice someone walking towards us. Maybe we've seen them around. We might even know their name. But we don't really "know" them. They pass by. We say a simple "hi" without looking up at them. We might not say anything at all. It's called complacency. It's a mindset we have that their day doesn't depend on a compliment from someone they hardly know. The truth is that just telling someone they look nice today could change their entire outlook on the rest of the day. It can shift their negative thinking to positive thoughts or take their already positive thoughts and multiply them. It all happens in just a few shorts moments that so often are skipped over each and every day. You can even take it one step further. Instead of simply complimenting them on how they look, take a moment and encourage them by telling them your favorite thing about their personality or the way they act. If you don't know them well enough, this could be a good opportunity for you to make a new friend. The bible tells us to encourage one another daily. When we do that, we show the love of Christ. That's why I'm going to make an intentional effort today. Words are powerful and you never know what kind of impact you can make in someone's life with just a few of them. Be blessed! Writing this, I think about all the wonderful things I have done, things I can honestly check off my bucket list, and also realize that life has gotten busy and the bucket list has been pushed aside. wrestled a bear, or bought that make-up you always said you would try? Winston Churchhill once said "History will be kind to me, for I intend to write it." So allow your grandchildren to tell incredible stories, about you, to their children. I don't know about you, but I want to be the most epic grandmother that will always be a giant and beautiful branch in my family tree. With the holidays just behind us, you've probably recently heard (perhaps from some dear extended family member) the question, "what're your plans for your life?" in some form or another. It's normal as humans to attempt to map out our lives as we please, but the Christian life is designed to be lived in a different way. God, the creator of our being, also has created a plan for us. We will not know every piece of that plan now, but how often do we even take the time to ask? Or dream? In this physical world it's easy to think it's up to us to figure it all out, or know our limitations and stick to them, but we are call to live life in a not so normal way. Today take some time and dream! Ask God what he has for you, and allow your heart to dream, because He is limitless in power and loves to give good things to those who seek Him. Decide to step out of your comfort today so that you can step into someone’s life. Make a difference in some way. When I got that Facebook message a month ago I was floored. That was over 4 years ago! Quite frankly, I barely remember the girl and definitely don’t remember that moment. But how incredible is it that a simple moment of stepping out and talking to someone we normally wouldn’t could be remembered years later. I didn’t preach at her, give her $20, or whip out my acoustic and sing her a love ballad—I just loved her. And please hear me out, I’m not saying this to brag about myself because trust me I’ve missed more opportunities than I have taken advantage of, but this is a really cool example of how God takes the little things we do in our lives and makes them mighty! When I got that message, I was at a point in my life where I really needed that reminder. God has a really unique way of turning blessings like that back around. Anyone can just talk to just someone—are you willing to shatter the walls of your comfort zone and go beyond what you’re used to? Be BOLD. Be COURAGEOUS. Be LOVE. Don’t you just love that feeling you get when someone blesses you? What about the feeling that you get when you bless someone else? Well how about doing both? I’m just going to have a cliché moment. Matthew 7:12 says “Do to others whatever you would like them to do to you. This is the essence of all that is taught in the law and the prophets.” As much as we all have heard this scripture verse, it’s so true! This is exactly the theme for today. The concept is the same. Today’s challenge is whatever you spend on yourself; spend the same amount on someone else, and I’m not just talking about money. Spend your time and love. You could go out to coffee with a friend and pay or give to a mission’s team. What about just simply asking someone how he or she is doing, and let him or her talk for as long as they want. Bless them with the gift of nonjudgmental listening. Anything you would appreciate, do it for someone else. I guarantee that you won’t regret it. Well lovelies, good luck with half and half! Go out and bless someone today, and you know what? Bless yourself as well! Volunteer somewhere! It could be anywhere! Whether you have to travel to do it, or set up a date to do it, make it set in stone to step out for the people around you. Think of the last time you handed out food at a local homeless shelter or walked a couple miles for a specific cause. Think of all the lives that were impacted by just a small amount of help on your part. Even a smile can turn a day around. I remember in high school, I would join my church youth group in volunteering at a neighborhood carnival. I can still see families leave with hands full of groceries and smiles on their faces who only hours earlier came in arguing and upset. It's amazing how a couple hours in the sun could make such a difference in the lives of so many. It was very hot that day but there is just something about putting the needs of others above your own; your worries seem to shrink. Philippians 2:4 says, "Don't look out only for your own interests, but take an interest in others, too." God designed us to be fulfilled while selflessly serving others. Is there a place in your area that is in need of volunteers? It can be a pregnancy care center or a local food pantry that is in need of a few more hands on deck. Every little bit helps and you are appreciated more that you know! Henry Ford said, "To do more for the world than the world does for you - that is success." Everyone loves a good gift. It’s exciting to unwrap or open a wonderful gift form a friend that means so much. But, you know what? It’s awesome to give gifts as well. It’s actually more rewarding. It’s such a wonderful sight, seeing the faces of your friends and family light up not only at the gift but at the thought behind the gift. We all want to be good gift givers. We want people to remember what we have given them. Hey, not every gift is going to be perfect but with time and thought and practice we can all become really awesome gift givers. When I think of great gift givers I can’t help but think of God who gave up His son, Jesus Christ, to the world to save us from our sins. The thing that we can learn from this act of gift giving is that the best gifts given are those that mean something; those that have or add value to the relationships that both you the and the receiver both share. So today, and really look to make that difference. Praying for others is one of the most effective ways to make a difference. Prayer does two things: it shows people that you care, and it gives God the opportunity to change their lives. So, today, slow down. Genuinely ask people how they’re doing. Pray for them. The first time I offered to pray for a friend, I was nervous. I got butterflies in my stomach and almost abandoned the whole thing. However, when I finally asked, my friend was so grateful that I did! So much of the time, we miss out on making a difference through prayer because we feel self-conscious. Don’t let hesitancy stop you. It will be worth it to the person you pray for. Psalm 66:19 says, “But God did listen! He paid attention to my prayer” (NLT). God hears us when we pray. Prayer is so much more than the “Christian” thing to do; prayer is a way to change the world. By praying for others, we are allowing God to be the one to truly make a difference. Today, ask God to provide you with an opportunity to pray with someone, and then watch the enormous impact that He makes! Today we are asking you to do something that may be scary. It may be simple. Either way, it matters. 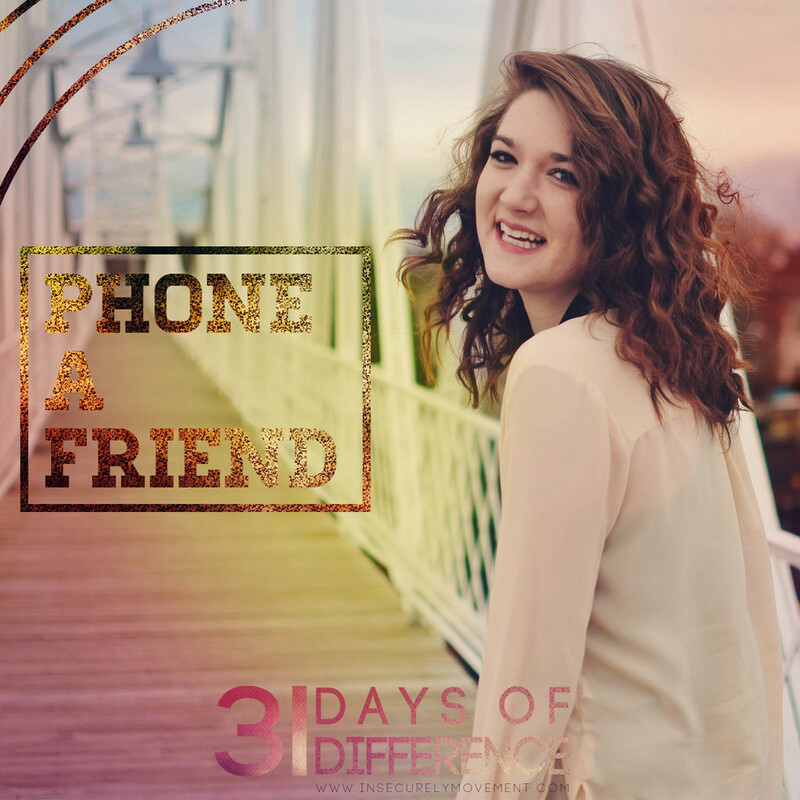 For day 20 of 31 Days of Difference, today we encourage you to share your story with someone! Open up to someone today by telling about how you became who you are, some of your dreams, passions, or even what is going on in your life right now. By doing this, you will encourage someone else and know that your life makes a difference. Many times I have found that sharing my life with someone can encourage them more than I ever thought possible. Who knows? You may have gone through something that someone else is right in the middle of. It means so much knowing that someone else knows what you're feeling or what you're going through. But, as I have shared my story with someone else it also encourages me. Speaking out about what God has done in my life is a great reminder of how faithful He is to me, even when I don't deserve it. Sharing your story tears down the walls that you build around yourself. It makes you vulnerable. But, it also makes an impact. So, share your story today to remind yourself and others that God's grace is never ending. "And they overcame him by the blood of the lamb, and the word of our testimony." I have never known a greater feeling in the world than the smile that comes from other people when you serve them. It's those million dollar smiles that make any situation better. Today I challenge you to be a servant. Maybe it's helping to do some extra cleaning around the house you don't usually do or maybe it is volunteering in a soup kitchen. It is totally up to you! Don't be afraid to stretch yourself! Ask your parents, grandparents or even your neighbors if there is something you can do for them. Some of these things may not be something you really want to or like doing but the joy and assistance it brings to others is an amazing payment. In Mark 10:45 it says, "For even the Son of Man did not come to be served, but to serve, and to give His life a ransom for many." If we can just think about that for a moment, Jesus came as the Son of Man, Gods Son, a King and yet he came to serve. He did not want nor expect people to bow down and do things for him, he did things for others. I think that is amazing beyond words. Now, go out today and be a servant and make some change in someones life. Be a light. An encourager. A smile. A warm gesture. A difference maker. Today, use some post-it notes (as many as you like!) and write a sweet little something to lift a stranger's spirit. Get creative with your placement! A "You're alive for a reason (:" on a coffee shop stool, or a "know your worth" on a bathroom mirror will make more of a difference in someone's life than you can imagine. So go for it! Be unique, get ready to make a difference in so many lives. Earlier this month, we did a product free day. However, your beauty is not on the outside, but the inside. So whether you are have no make-up or a lot of make-up, you have the same beauty shining from inside! So today, dress up just for fun! 1 Samuel 16:7 says, "The Lord does not look at the things man looks at. Man looks at the outward appearance, but the Lord looks at the heart." The Bible tells us that even in Bible-times people cared about outward appearance. But as followers of the Lord we must desire to see as God sees. When God sees us, He sees us as beautiful because of what is in our hearts. God looks to our hearts to find beauty. God cares about our hearts so much that He tells us to guard our hearts above ALL else (Proverbs 4:23). God does not care what we look like on the outside as long as it is honoring him (ie. As long as the focus of how we dress is not to attract more attention to ourselves than to God). God cares about the inside, because that is where true beauty lies. So have some fun today—put on your best outfit, fix your hair up, and maybe even go out with some friends. A part of discovering who you are is learning to let go and have fun, so doll up! Somedays, I honestly wish that people would show off, hat life was like a circus and I could see all the crazy, weird, and beautiful things that people have been given by God. being a goose until people began to approach me and telling me how much I have blessed them through that. Romans 12:6 says " Having gifts that differ according to the grace given to us, let us use them". So, go out and share it. Show them what you are made and show them just how incredible you are! The problem here is that we have “treat others the way you want to be treated” and Mark 12:31, “Love your neighbor as yourself” so engraved in our head that we don’t actually take into consideration the reverse point of view with these sayings and the question that goes along with that. “How DO we REALLY want to be treated?” How can we fully understand that statement and verse without knowing how we actually want to be treated ourselves? I think today is a great day to sit down and list at least ten ways we, as individuals, would want to be treated, such as respected, loved, shown courtesy, etc. and then find a way that to treat yourself that way today. You are just as important as those you treat kind-heartedly. Take some time to yourself! Maybe, ask for the day off if you work too much! If we can’t take care of ourselves, how can we treat others? You know, like when you’re on an airplane and the stewardess announces that if the plane were to be coming down and you needed oxygen masks to put yours on first! Because if you pass out, you’ll be of no help to your neighbor and then you’re both doomed! ...That may be a terrible example to help you to understand what I’m getting at, but hey... I’m not a writer and I love airplanes, so work with me. I guess all I’m saying is that I believe “when you bless others, you are blessed” can go both ways. It’s reciprocity. When you truly feel blessed you want to give more! So treat yourself today! Stop looking at your messy room/house/life like it’s slowly killing you and take a nap. Stop making life harder than God intended for it to be. God is TOTALLY a God of fun. Alerts, deadlines, mental to do lists, and vibrating pockets are the background music of our everyday life. With every moment bombarding us with new messages, it is easy to forget about the simple, and lose sight the most basic concepts of life. With a full time college course load, a couple of jobs and ever changing relationships to think about, my brain is always running at a million miles an hour, so even as an extreme extrovert, after a few days of nonstop I can feel myself begin to shut down. This semester as I faced new challenges and a busier schedule than ever before, I was forced to look for a way to release stress. One night when I was near breaking point I went for a walk, and since then I have taken walks nearly every day . These journeys have helped me to reconnect with reality, remind myself of the big picture, and actually take the time to process everything that is going on in my life. The Bible mentions Jesus going on walks or going down to a lakeside or up to a mountain several times in the gospels, and I'm sure that was where he sought his Father outside of the noise of the crowd. Luke 6 even records Jesus spending an entire night on a mountain praying! It's amazing the difference that a short (or sometimes not so short) walk can make! So I encourage you, separate yourself from the constant noise for an hour or so, grab your journal, guitar, bible, or simply your shoes, and go for a journey. On your walk take the time to simply tell God where you're at, and allow him to quiet you and give you peace and strength to take life by the horns and not just allow it to drag you along. Eleanor Roosevelt once said, "The future belongs to those who believe in the beauty of their dreams". We all have dreams, ambitions, and goals, but not many of us ever dream of chasing them. It's very easy to dream big. The hard part is believing that your dreams can become reality. The good news is that you have someone in constant support of your dreams, standing beside you every step of the way, and opening doors for your dreams to come true. That someone is God, and all you have to do is stay faithful to Him and everything you dream of having in life He will help you see it through! So today I challenge you to dream. But don't just dream, dream a God-sized dream. If your dreams don't scare you, they're not big enough. So make a list, 5 that are semi-possible, and 5 that are completely outrageous, scary, and may even seem impossible. Then tape them somewhere you will see them daily. Your bathroom mirror, the dash of your car, the front of your planner. Every time you see them say a little prayer to God that with His help you will see your dreams become a reality. I am so glad you are making this journey with us! May God continue to bless you as you make the commitment to 31 days of difference!